Plastering is a process by which coarse surfaces of wall or ceiling roofs are changed or turned or rendered to provide smoothness. In the beginning, wet materials are spread over the block or brickworks and then suitable equipment is used to make the surface smooth level. 1.Lime Plaster: Lime mixture consists of sand and line that are mixed by 1 sand to 3 of lime by volume. Not only this mixture is used for undercoat but also used as a finish coat. 2.Gypsum plaster: Gypsum plaster is widely used plaster materials that could be mined naturally or produced as a by-product. So, important gypsum plaster that is employed as an undercoat, finish coat and replaced lime and cement broadly. 3.Smooth-Cast Plaster Finish: To obtain a smooth cast finish, the mortar used should be in the ratio 1: 3.Fine Sand should be taken to prepare the mortar. For spreading the mortar, skimming float or wood float is the best suitable tool. Hence, smooth and leveled surface is obtained finally. 4.Rough Cast Plaster Finish: Roughcast finish is also called as spatter dash finish. Mortar used to get rough cast finish consist of coarse aggregate along with cement and sand. In the US, the there are two main types of plaster, and they have different properties. cement plaster uses cement as the binder; it is water resistant (not waterproof), it is weather resistant; and it is typically built up in two or three coats to 5/8″ or 7/8″ thickness. When you see plaster on the exterior of a building, it is cement plaster. Also known as “stucco” . Cement plaster “recipes” have varying amounts of portland cement, lime, sand and water. Lime will make the plaster easier to work, but it can result in a slightly longer curing time. (old plasters — like in the deep south in the US, were almost entirely lime plasters, and they could take 6 months to fully cure for each coat). Gypsum plaster: this uses gypsum paste as the binder, and it is extraordinarily hard and strong — but its not water resistant. This is used typically for interior walls, and was the primary way of fireproofing walls before gypsum wallboard was invented. We still use gypsum plaster for impact resistant surfaces — like in jails or prisons. You can get up to 1500 psi for the surface. It is typically applied over a plaster base, but the plaster itself is usually not more than 1/8″ inch thickness, applied in two coats. The disadvantages of plaster from a construction standpoint is the multiple passes of labor over the same location. 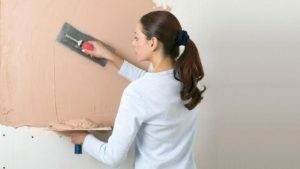 it generally takes 24 hours for a plaster coat to cure, so if you’re doing two or three coats of plaster it means that you scaffold and staff up the same wall three times in a row. We’ve usually seen a substitute for this work by using an acrylic based finish system, which can be done in one pass. That discussion is best saved for another time.